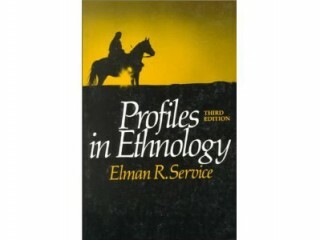 Birthplace : Tecumseh, Michigan, U.S.
His long teaching career of over 40 years encompassed an extensive audience, augmented by the fact that his textbook, Profiles in Ethnology(see the picture above), which went through three editions (1958, 1963, 1971), was widely adopted. Other books, such as Primitive Social Organization (1962, 1971) and The Hunters (1966, 1979), were adopted as texts; a number of his books were issued in translation (in Spanish, Portuguese, Japanese, German, and Hungarian); many of his articles and chapters, such as "Indian-European Relations in Colonial and Latin America" (1955), "Kinship Terminology and Evolution" (1960), and "The Law of Evolutionary Potential" (1960), were reprinted in collections directed to students. Thus, his influence was great within the academic community of the time. * Service, Elman R. 1954. Tobati: Paraguayan Town. Chicago, IL: University of Chicago Press. * Service, Elman R. 1955. Indian-European relations in colonial Latin America. American Anthropological Association. * Service, Elman R. 1958. A Profile of Primitive Culture. Harper & Row Publishers. * Service, Elman R. and M. D. Sahlins. 1960. Evolution and Culture. Ann Arbor, MI: University of Michigan Press. * Service, Elman R. 1970. Cultural Evolutionism: Theory in Practice. International Thomson Publishing. * Service, Elman R. 1971 (Original 1962). Primitive Social Organization (2nd edition). New York: Random House. * Service, Elman R. 1975. Origins of the State and Civilization. New York: W. W. Norton & Co. Inc.
* Service, Elman R. 1978. (Original 1958). Profiles in Ethnology (3rd edition). Addison Wesley Publishing Company. * Service, Elman R. 1979. (Original 1966). The Hunters. Prentice Hall. * Service, Elman R. 1985. A Century of Controversy, Ethnological Issues from 1860 to 1960. Academic Press. View the full website biography of Elman Service.